Images credit & copyright: ESA/Mars Express. The European Space Agency’s (ESA) Mars Express mission entered Martian orbit on December 25, 2003 with its lander, Beagle 2 (RIP). Although Beagle 2 landed successfully, only two of its four solar panels deployed which blocked its communication antenna; rendering that part of the mission null. Luckily Charles Darwin’s HMS Beagle was much more successful. In the end, it’s easy to be light hearted about that because the mission’s orbiter has been delivering data and images the entire time and some of them have been nothing short of spectacular. 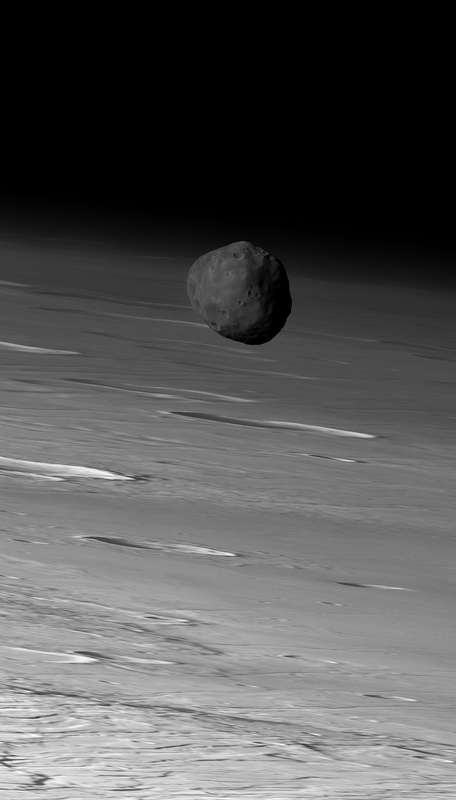 The above first image is the largest of the two moons of Mars; Phobos as it quietly orbits 6,000 km (3,700 mi.) above its surface. Its 11 km (7 mi.) in diameter and orbits Mars every 7 hours and 40 minutes which means if you were on the Martian surface it would rise in the west where it would be up for just over four hours before setting in the east twice per sol (day on Mars). This image was taken by Mars Express High Resolution Stereo Camera (HRSC) on March 26, 2010 while on orbit 7892. In this next image we see Phobos yet again, but this time Mars Express caught a wonderful alignment (conjunction) with Jupiter and any time I see two or more planetary bodies in close proximity some perspective is in order. When this image was taken on June 1, 2011, Mars Express was 11,400 km (7,084 mi.) away from Phobos which is pretty damn far but how about Jupiter? 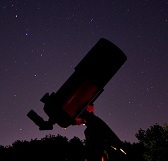 Mars next door neighbor was amazing 529 million km (329 million mi.) away if you can even successfully visualize that stretch. 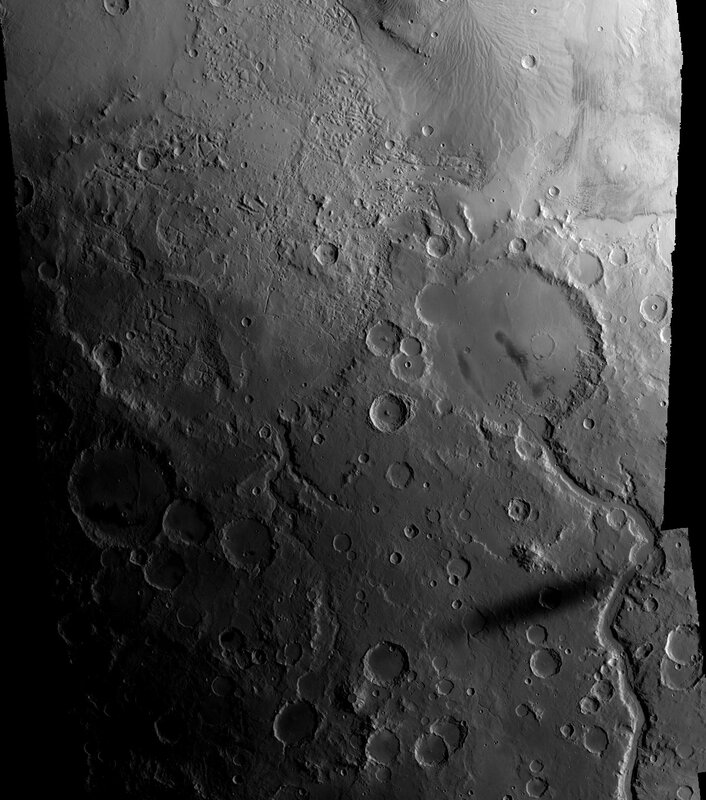 This third image is actually pretty incredible as were looking at the shadow of Phobos race across the Martian surface. What about that large crater, the one with the long tail? That’s Gusev crater, the home and final resting place of Mars rover, Spirit. I hope you enjoy these images and hit the links below so check out hundreds more. Image | This entry was posted in Images, Solar System, Spaceflight Companies & Vehicles and tagged DanSpace77, ESA, European Space Agency, Gusev Crater, Mars Express, Martian, Phobos, Solar System. Bookmark the permalink.